Each time you make a reservation through this website, your reservation is made directly with Romantica Apartments. As such, you are guaranteed the lowest possible rate, unlike reservations made through third party systems (whose prices include the given platform’s commission). 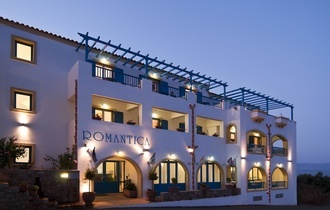 To send a reservation enquiry directly to Romantica Apartments click here! "Romantica Apartments" found at a very lovely location at Agia Pelagia, on Kythira island, with the backdrop of the mountain, and a beautiful view of the sea. It is built at an exceptionally quiet location according to the traditional architecture of the area, catering to the modern needs of hospitality and with the comfort of an excellently equipped tourist unit. It is only 100m from the beach of Agia Pelagia, 26km from Diakofti (the port of Kythira) and 17km from the airport. 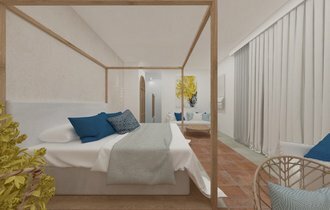 Romantica Apartments offers its guests, studios, apartments with one or two bedrooms, one junior suite, with big verandas and balconies which have a view of the sea, the mountain and the pool. Each unit is equipped with attention to every detail. 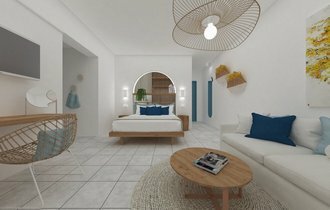 The soft colors of the interior décor will help you to relax and get away from your daily monotony, in a friendly, family atmosphere. At night in the discreetly lit pool area, you can have your drink or try an exotic cocktail. The hotel can accommodate disabled individuals.